THE B-MOVIE NEWS VAULT: The Strange Case of the BLUE MONKEY Crowdfunding Campaign. The Strange Case of the BLUE MONKEY Crowdfunding Campaign. 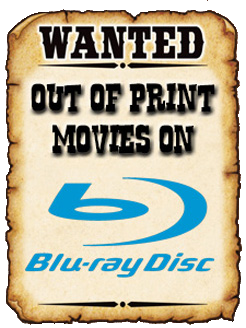 Please note, my goal with this post is not to sling mud at Bill Olsen and Code Red DVD. I appreciate the efforts made by Bill's company, and plan to continue promoting their new Blu-ray releases when possible. However I do feel the need to draw attention to an unfortunate situation that I inadvertently became part of, and make sure to aid those that were affected by it. 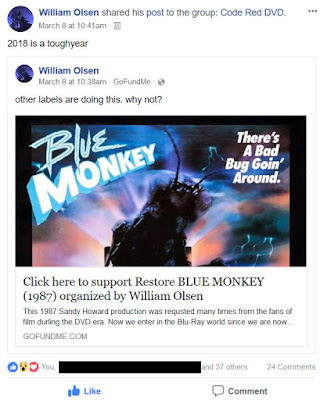 Just over a week ago, yours truly shared THIS POST promoting a crowdfunding campaign started by Code Red DVD's proprietor, Bill Olsen, to raise money for an HD restoration of William Fruet's BLUE MONKEY. Days later, after receiving some negative feedback from people on social media (and the GoFundMe page), Bill canceled the campaign. Being one of the unfortunate donors of said campaign, I expected to be notified by Mr. Olsen at some point about the fate of my $30 pledge. After about four days, I tried to contact Bill via private message on Facebook, sent an e-mail, and even attempted to hail him on Twitter, but to no avail. I politely inquired if my thirty dollars was going to be refunded, or if it was going to go towards the eventual Blu-ray release of BLUE MONKEY. 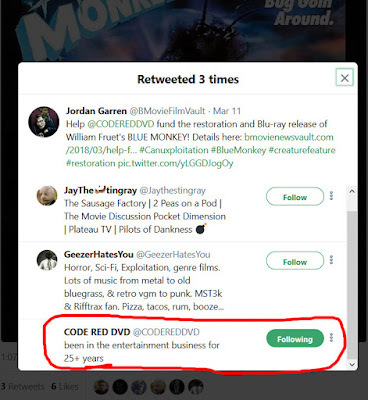 While patiently waiting for any sort of reply, I visited the Code Red DVD thread over at the Blu-ray.com forums to see if any news could be found there. EXHIBIT C - Bill promoting the GoFundMe campaign. EXHIBIT D - Code Red DVD (presumably Bill?) retweets my BLUE MONKEY post. So here's what I've gleaned from everything I've read online: I'm assuming someone talked Bill into trying crowdfunding to pay for BLUE MONKEY's restoration. Having never attempted it before, he chose GoFundMe instead of IndieGoGo or Kickstarter. Bill then failed to put enough information on his GoFundMe page, resulting in criticism for the unintended "shadiness" of the campaign (and for the $30 price tag for the planned Blu-ray), so he became angry, and deleted the page. Then instead of reaching out to donors, or rectifying the situation in any manner, Bill attempted to distance himself from the entire thing. His claim that he didn't start the account or have access to the money is questionable to say the least. And even if that were true, Bill clearly supported the crowdfunding endeavor (as proven by the above Facebook post and Retweet), so you'd figure he would take the time to get things sorted out. But as far as I can tell, nothing is being done, so what are the dozen or so donors supposed to do? Contact GoFundMe and get a refund immediately! WHAT BEST DESCRIBES YOU? - I am a donor and I have a question about donating. PLEASE SELECT THE ITEM YOU NEED HELP WITH - I would like to refund my donation. You'll get an automatically generated "answer" with two buttons beneath it. Click on the I STILL NEED HELP button. Fill out the new form and follow the prompts. Choose the I HAVE A QUESTION ABOUT FRAUD, TRUST, AND SAFETY option from the drop-down menu. After that select WHAT IS CONSIDERED FRAUD ON GOFUNDME? After you reach this point, click on the I STILL NEED HELP button. Answer all the questions and follow the prompts and then send in your report. You may be asked for "proof" during this process, so feel free to share this News Vault post (and/or any of the screen grabs above) as your evidence. If all goes well, you should have the money transferred back to your account within 3 - 7 business days (or sooner). Here's hoping everyone gets their cash back, and that we eventually do get a nice shiny Blu-ray of BLUE MONKEY later on down the road!